The German artists Hera and Akut, both with roots in the graffiti scene, joined forces in 2004 and began creating collaborative work under the name Herakut. The duo has shown around the world, including in Los Angeles, San Francisco, New York, London, and Bristol. They have published two books, The Perfect Merge in 2009 and 2011’s After the Laughter, to great success. "Herakut’s paintings are sensuous, savage, and always remarkable for their powerful dualism. Akut’s photorealistic details play out against Hera’s expressive, more gestural, line-work in canvases that seem poised to articulate stories of triumph and hardship. Humor and text are weaved into the work effortlessly." 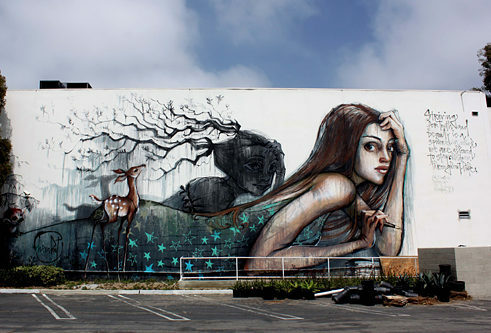 Herakut are: Hera, Jasmin Siddiqui, born 1981 in Frankfurt, Germany. Studied Visual Communication/Graphic Design at the University of Applied Sciences in Wiesbaden. Started graffiti in 2000. Akut, Falk Lehmann, born 1977 in Schmalkalden, Germany. Studied Visual Communication/Graphic Design at the Bauhaus University in Weimar. Started graffiti in 1991.